Perform a random act of helping someone in real need. Most people will think of something like buying a cup of coffee for the person behind them at their favorite coffee shop. Certainly, that’ll put a smile on both your faces, but that won’t give you as big a lift as you get when you jump in to help someone who’s really in trouble. There’s nothing like the charge you get when you know you’ve actually made a difference in someone’s life. And there are many other ways to get that feeling too. Volunteer through an organization that helps people in need. There’s no end to charitable groups that can put you to work. Of course, you can write a check for a cause you believe in, but actually spending time helping to make a difference in the world is even more satisfying. Check out your favorite organization to make sure they’re “kosher”, and then schedule a little time to help them—and yourself. Connect with someone who’s disabled, chronically ill, or elderly, especially someone who can’t get out much. Maybe you know someone who used to be active but doesn’t socialize much lately. Give that person a call, just to chat a few minutes. Ask if they need anything, and if you can help, do it. But one caveat: Don’t presume you know what they want or need. Treat them with respect by honoring their wishes, not your own. You’ll both feel better about the relationship. Help a young person. Even though it seems children and, especially, teenagers are hard to connect with, treat them like intelligent human beings and you’ll be surprised how well they communicate. You can help them by acting as a mentor and/or tutor. Something as simple as listening can make a real difference in the life of an otherwise troubled student. Go green. Take advantage of recycling programs in your area. Instead of throwing away used items, donate them to a local thrift store. Be sure to get a receipt and you can take the charitable deduction on your taxes. There are so many ways to improve your carbon footprint, from buying items made from recycled materials to weatherproofing your home and updating your vehicle. No matter how serious you get, these steps will be good for your ego, your pocketbook, and the environment. Now, that’s a win-win-win strategy. Go ahead. Try one of these techniques. I guarantee you’ll feel better about yourself, and you’ll probably make someone else feel better as well. 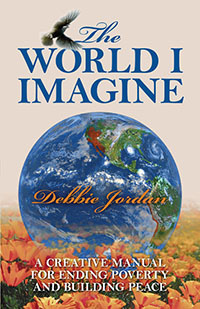 Debbie Jordan is the author of The World I Imagine: A creative manual for ending poverty and building peace. Visit her website http://www.imaginetheworldatpeace.com/.